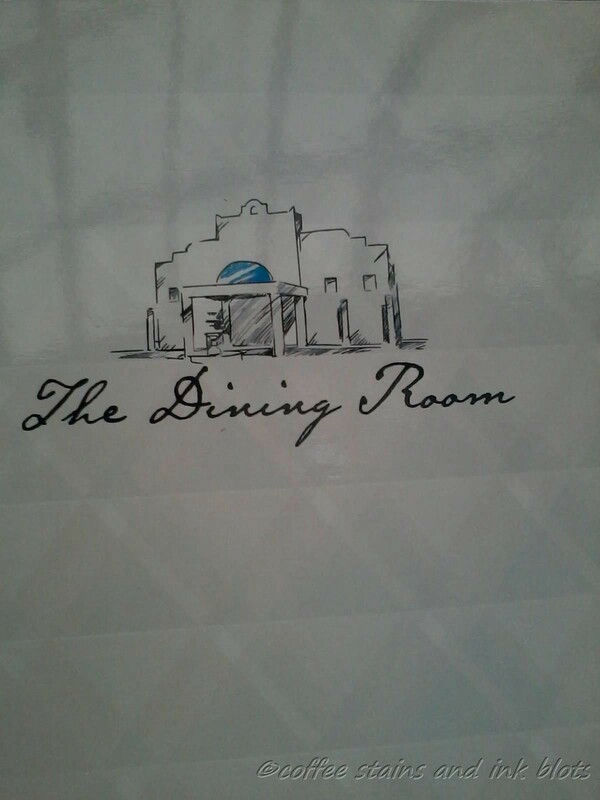 on our way home from one of our tagaytay trips, we decided to have lunch at gourmet’s the dining room. going down the driveway, you will see a santorini-inspired structure. opening the big doors, and taking in the view of the white, clean and chic interiors, you know that you are in for a treat. the restaurant boasts of italian/mediterranean cuisine with most of its ingredients sourced from gourmet’s own farm. there was a salad station available inside but we did not avail of that. instead we ordered three different items from the menu. 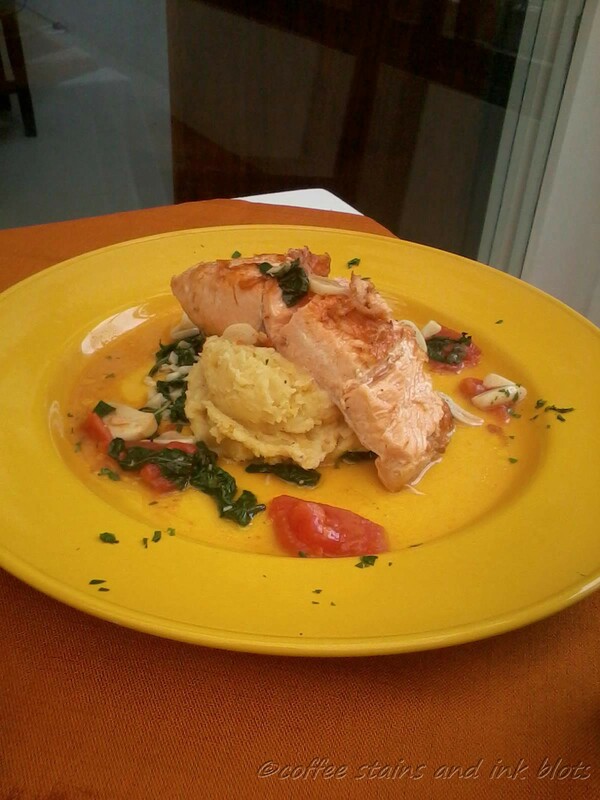 baked salmon – oven baked salmon fillet with mashed potato and sauteed spinach. this was junjun’s order. the salmon was baked perfectly and was flavorful. the mashed potato also complimented the fish. tuna sandwich – bougette tuna filling, tomato, lettuce and cucumber. this was an order for matteo. the sandwich was filling and it could be easily a meal in itself. 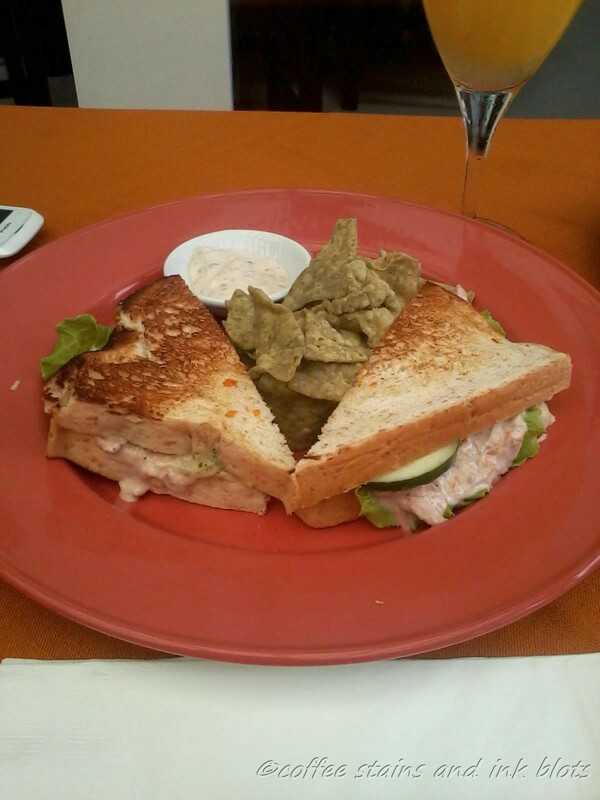 what i loved are the veggie chips (made of malunggay i think) which accompanied the sandwich. it is great alternative instead of the usual potato chips. the dining room special – coffee and spice rubbed ribeye or tenderloin fillet with mashed potato. this was my order. there is also a side salad that accompanied this. i had my steak done medium well. 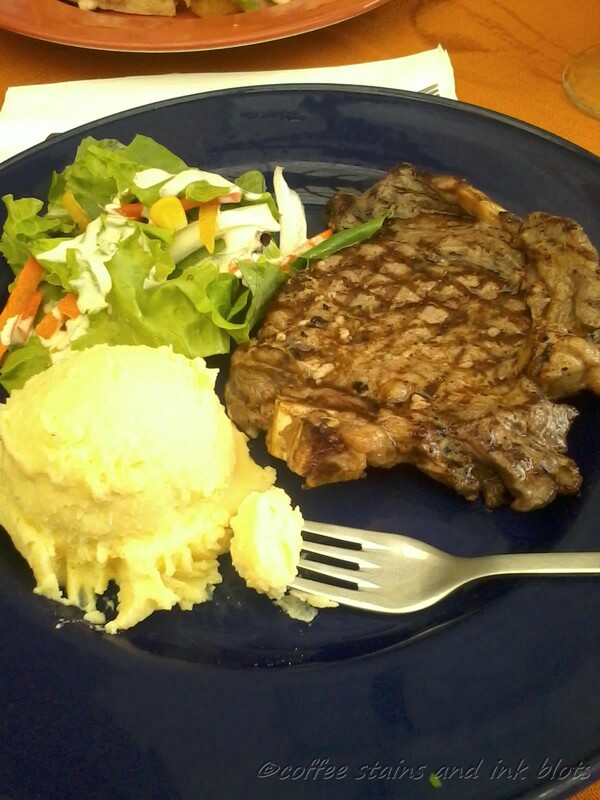 i liked how the steak was flavored and it was tender that i did not have a hard time cutting the meat. we also ordered the dalandan juice and ripe mango shake for Php 85.00 each. for its price, i would say the taste and serving of the food was worth the peso paid. the ambience of the restaurant is also a plus. the waiter and other staff were also attentive and was very helpful. This is our 3rd time eating here. For today we ordered lasagne al forno and san prieto con basilica (cream dory). For our drinks, we had green iced tea and iced tea. Of course, there was the bread with balsamic vinegar and olive oil dip which was served right after you have settled down. The fish was very juicy and tender, it was also very flavorful. It had sidings of potatoes and steamed vegetables. The lasagna was very rich and savory. It was the perfect blend of ragu, sauce, pasta andt cheese. 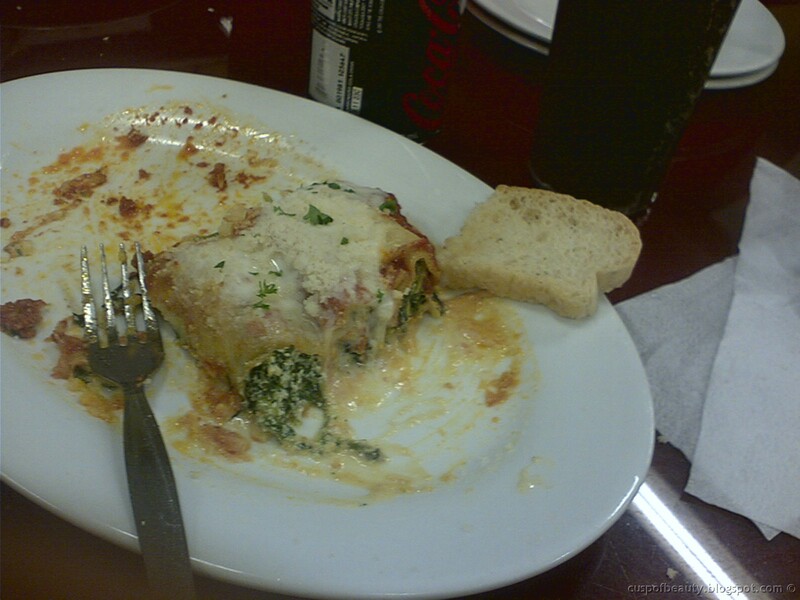 It is always a treat eating at Buon Giorno, and I am looking forward to the next time we will be eating here. If you are planning to dine here, it is better to make reservations, especially during weekends and holidays. You can also opt to use the opium bed outside, which will give you a view of the tall volcano. last friday, Junjun and I had our “date” at Amici in Don Bosco. i have heard a lot about this place and decided to check it out. for a brief background, amici was used to be a school cafeteria ran by the priests of don bosco. But some years ago, it was bought by the group that owns red ribbon. since then, there have been changes. other branches have also been open. 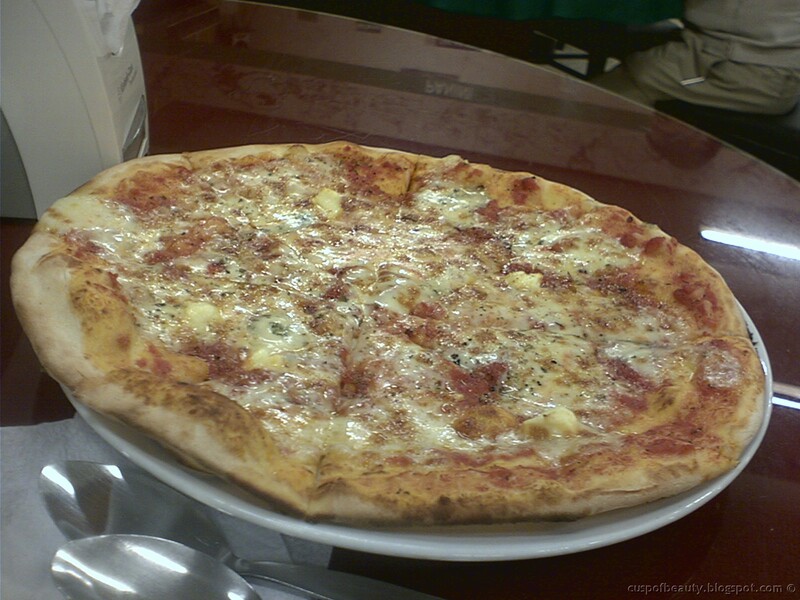 for our dinner, we ordered al quattro formaggi (pizza), cannelloni agli spinaci (pasta) and soda. 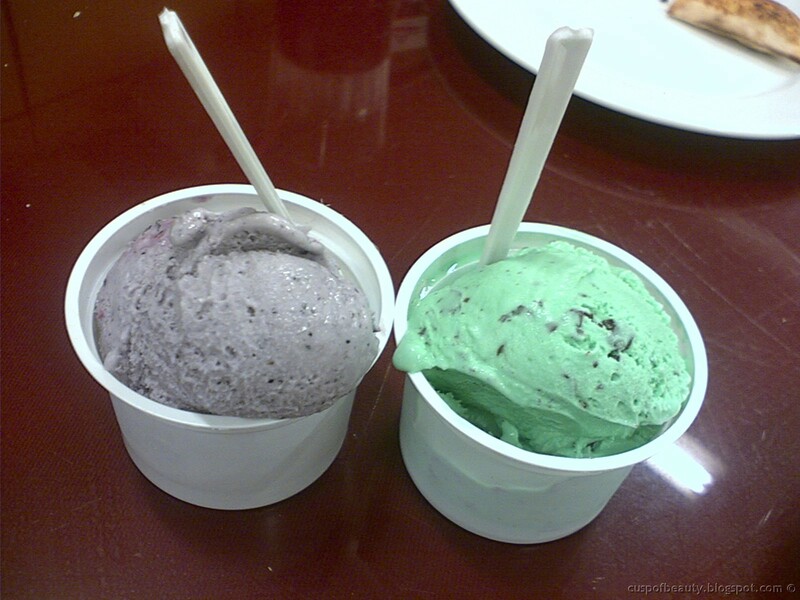 of course, we also had gelato.